Welcome back, Educators and Book Lovers! Today is Earth Day, a time when people all across the nation can join in both celebrating the bountiful beauty of our planet and raising awareness of its precious, finite resources. 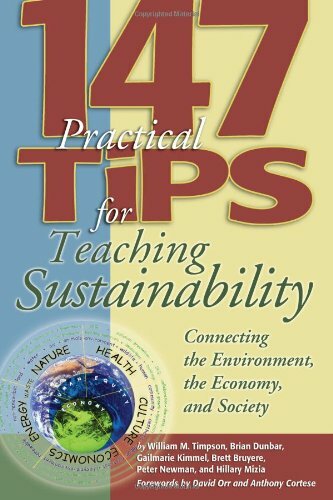 We at Atwood want to take this occasion to share with you a handful of helpful hints on sustainability and how to teach it from 147 Practical Tips for Teaching Sustainability: Connecting the Environment, the Economy, and Society. In a discussion or debate, assign one individual to be the “advocate” or “watchdog” for future generations, offering perspectives and insights that might otherwise be missed. The key to running a successful business is staying profitable. When presenting sustainability-minded projects, lead off with return on investment and economical feasibility. Traditional business is run with an eye on a single bottom line (financial) as opposed to the “triple bottom line” idea that sustainability presents. Because any good business person realizes the value of staying in the black, anyone presenting sustainability innovations must address the dollars aspect, and is wise to do so first. Simply put, sustainability is about running a profitable business for a long time in an environmentally friendly and socially balanced manner. Ask students to interview local business owners regarding their single and triple bottom lines. Get your sustainability news in the news. Whether it is an issue of urgency or a story of success, the general public needs to see it. Raising these issues on the media agenda will ultimately raise them on the public agenda. For those with a message of sustainability to share, create a public relations campaign. Make contact with media outlets and maintain a positive connection with reporters and others in a position to broadcast your message. Turn your information into materials (such as news releases) the media can use. Make them prewritten and packaged in a way that the media won’t have to do much extra work to reproduce them as stories. Make sure that when you are sharing information through a media outlet, such as newspapers, television, and the internet, the information you produce is easy for everyone to understand. ← Tips for a New Year and New Semester!